Below are short videos captured at the 2003 Ann Arbor Art fair. 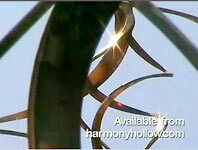 The site is the Harmony Hollow booth at the windiest corner in Ann Arbor, ideal for displaying our wind-activated art. You must have a QuickTime player installed on your computer in order to view these. Go to the QuickTime site to download the free Windows and Mac players. These are large files; if you are on a slow connection (i.e., a telephone modem), these will be a test of patience to download. If you have broadband (a cable modem or DSL line), this is not a problem. The clips are arranged in order from smallest to largest, so start with a small one if you are on a slow connection. These were taken with a Canon Elura camcorder, reviewed in iMovie, edited in Final Cut Pro, and compressed with Cleaner. Selecting a clip will take you to a new page where the video will download and play. Click on the pictures below to go to their movie pages. Spinners Ensemble: a group of Infinities and Orbiters whirling at max. No audio. Closeup: this is a close view of an Orbiter, showing the mesmerizing action and details of the interesting patterns on the surface of the copper. No audio. 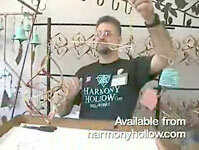 Bradley among the Spinners: Bradley describes the features of the Harmony Hollow line of Wind Spinners, and demonstrates the Infinity Bell Mobile. 4.3M (For broadband users only, or for incredibly patient modem users).